Time to Talk Day encourages everyone to talk about mental health. Mental health problems affect one in four of us, yet people are still afraid to talk about it. For people who struggle with their mental health, not being able to talk about it can be one of the worst parts of the illness. So, by getting people talking about mental health we can break down stereotypes, improve relationships, aid recovery and take the stigma out of something that imacts us all. Since Time to Talk Day first launched in 2014, it has sparked millions of conversations in schools, homes, workplaces, in the media and online. This means Time to Talk Day is the perfect opportunity to start your workplace talking about mental health. 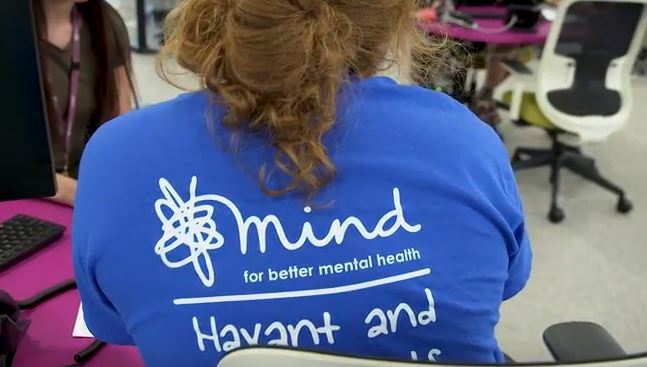 Havant & South Downs College got involved with Time to Talk Day by inviting Mind into the workplace to share information and to start a conversation about mental health with employees. Mind Community Development Officer, Mike Lock, said: “We are here for the Time to Talk Day which is a national campaign led by Mind and Time to Change. Across the country we are encouraging more people to have conversations about mental health and feel a bit more at ease about discussing it. “For us specifically we have been talking about the services we offer and how anyone can come in and chat to us in Havant. It’s important for us to be a visual presence, we are going to over 30 locations today so people can see us and hopefully go away and look into the campaign.